What does expanding brain meme mean? The expanding brain meme shows the ironic progression of ideas (from supposedly primitive to more advanced) using a sequence of images depicting various stages of spiritual or mental enlightenment. Not since the Scumbag Brain Meme, has a meme about the brain taken off more than the Expanding Brain Meme. Where does expanding brain meme come from? The expanding brain meme first emerged in January, 2017 on the Reddit subred: r/dankmemes. The original meme consisted of four images. The first featured a small brain inside an x-ray next to the word who. The second image illustrated a larger brain, with pink and purple lights representing neural activity, next to whom. Yet larger and more luminescent, the third brain image was paired with whom’st. The final head, next to whomst’d, had green beams radiating out of the brain, as if it were exploding with enlightenment. Whom’st and whomst’d are nonsense words, likely inspired by corrections (or miscorrections) of who and whom, and they are used to mock faux-fancy forms of whom. 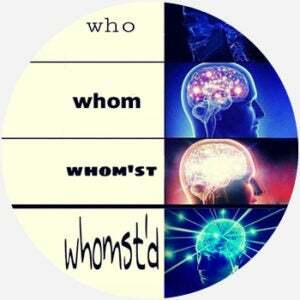 The meme quickly spread in 2017 from Reddit to the likes of Tumblr and Twitter as users cleverly substituted the who-whomd’st progression for other absurd sequences. Who uses expanding brain meme? The meme is typically used online for general humorous observations, satire, social commentary, and ridicule of others. Some users participate in the meme to show off an original, clever, or out-of-the-box idea. Given its quick spread, many instances of the meme are meta, poking fun of the sudden popularity it came to enjoy in internet culture. The expanding brain images can vary in number and form, but the meme follows a set pattern: It’s laid out in panels of images, alongside corresponding text or images, that convey increasing intelligence and consciousness through images of larger brains, more intense light, and sometimes even depictions of unity with the cosmos. The final panel, or most enlightened level, lands an ironic, facetious, or downright preposterous punchline. One version of the meme, for instance, progresses using such imagery with the following text: “the Earth is round,” “the Earth is flat,” and “the Earth is a cube.” The culmination is an image of Earth rendered in the form of a velociraptor. This meme pokes fun at flat-earthers. Though pictures are an important part of the expanding brain meme, they’re not essential; people have created text-only iterations, signaling the meme with some context. In some corners of the internet, the expanding brain meme has become sufficiently familiar that people often compare, in casual conversation, someone’s intelligence, or idiocy, to the last panel of an expanding brain meme.